Hijiri annoys me in this volume. Irritation isn't the emotion that I should be feeling. Pity is probably more appropriate. Hijiri has such a low self-esteem. This isn't uncommon in a teenage girl but it manifested itself in so many ways in this volume that I couldn't help roll my eyes. First Hijiri has a nervous breakdown because there's a new Russian prodigy. Once she sees Lilliana perform, she loses it - she has stress induced hearing loss. She can't imagine performing after someone so good. 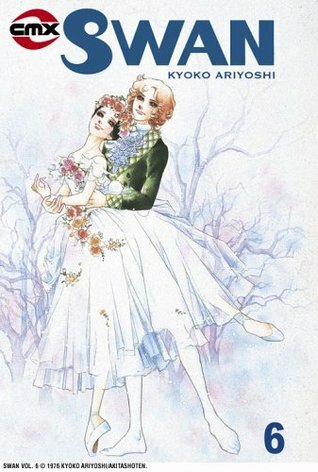 Then, when Hijiri gets back to Japan, she discovers that she has landed a better role in a ballet than Princess Sayoko, the injured star of Japanese ballet. She feels guilty that she has usurped her idol. Then she feels even worse because she's worried that she's going to force Princess Sayoko push herself too hard and get hurt again. My head is spinning from all of Hijiri's stress. Then we have the arrival of a little love triangle. There are two male Japanese ballet dancers who are significant characters in the story. Hijiri apparently has a crush on the dark haired guy. I don't believe he feels anything for her beyond friendship. But the light haired guy is in love with Hijiri and she's put him into the friend zone. It's all a little confusing. I wonder where it will go in future volumes. Poor Hijiri! She sounds like *she's* about to have a breakdown from all the stress! Your blog is beautiful!! :) I just stumbled upon you on the Blog Hop, I look forward to your posts! I don't read manga but what a pretty cover.